TBS (Transport Block Size) for BL/CE UE is determined by 36.213 Table 7.1.7.2.1-1: Transport block size table as in legacy LTE. The difference between M1 and legacy LTE lies in mapping between I_MCS and I_TBS and the possible range of I_MCS. 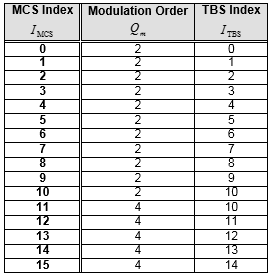 The modulation order is determined according to following table CEModeB UE is not expected to receive a DCI format 6-0B indicating I_MCS >= 10. For CEModeA, TBS of a user data PUSCH (except PUSCH scheduled by Random Access Response) is determined by following table.